Return to the world of Laura Ingalls Wilder’s classic series with this gorgeous box set, which includes hardcover, unjacketed editions of the first three Little House novels—all featuring new, iconic cover art, special forewords, and no interior art. Based on the real-life adventures of Laura Ingalls Wilder, the award-winning Little House series has charmed generations of readers with its depiction of life on the American frontier. 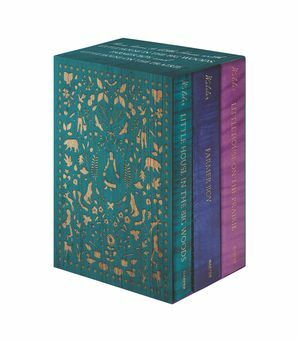 In this collectible box set, see how it all begins in Little House in the Big Woods as Laura Ingalls travels with her family from the woods of Wisconsin to the prairies of Kansas in Little House on the Prairie, while in Farmer Boy, Almanzo Wilder grows up with his brother and sisters on a big farm in New York state.